100 Ways to Motivate Others is the culmination of many years of successful leadership coaching and training by best-selling author Steve Chandler and attorney Scott Richardson, and the natural follow-up to Steve's two previous best-sellers-100 Ways to Motivate Yourself and Reinventing Yourself. Chandler and Richardson have crafted a vital, user-friendly, inspirational guide for executives, managers, and professionals...and those aspiring to reach their level. Breakthrough concepts, such as "Don't manage people, manage agreements," abound in this book of short takes for the time-challenged leader. 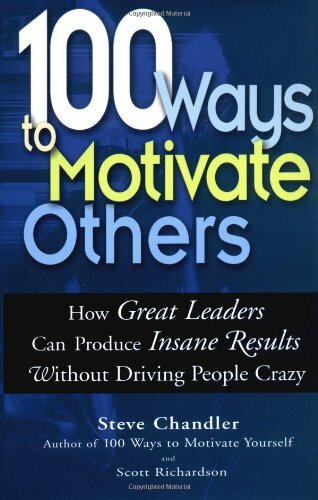 100 Ways to Motivate Others draws on the success of live workshops, seminars, and personal coaching programs on communications and leadership. These seminars, done for such organizations as Banner Health, General Dynamics, Scripps Hospital, Wells Fargo Banks, Bristol-Myers Squibb, and M&I Banks, appeal to managers, teachers, parents, CEOs, and coaches everywhere.